Last night was our "breakfast for dinner" meal at the Sweet Pea home. 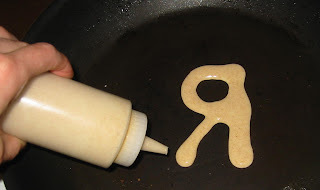 I once tried to use pancake molds on our pancakes, but I wasn't really happy with how they turned out. ...voila! 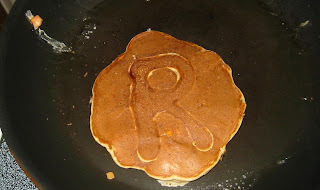 Personalized pancakes for my Sweet Peas. Of course G got one too! Trust me, this sort of creativity and extra effort rarely happens during our weeknight meals. I had one of those wonderful days where the boys played well together, my stress was minimal, and I was feeling artsy in the kitchen. What a fun way to put an extra special touch on dinner. PS--Happy Anniversary Mom and Dad!!! Thanks for being so thoughtful in the middle of all you do! We are blessed to have a daughter like you! so cute !!! i love the bfast for dinner idea, need to try it !! very cute, they look oh so good too! 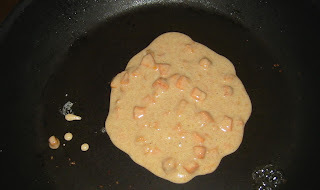 Making pancakes like this is one of my first memories of "cooking" when I was a girl. I think I saw the idea in a circa 70s Strawberry Shortcake cookbook in fact, that I think my mom still has! Thanks for reminding me! And have a great weekend. That is such an AWESOME idea, especially for our little preschoolers....and I think even my husband would be impressed with an "M" for him! 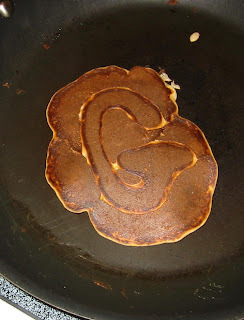 You could do shapes...flowers & put blueberries in the middle...I might need to make pancakes soon!! I love this idea! I know my kids would too. They already tell people pancakes are their favorite food.